First of all, high five for being able to sleep in this morning?!? I mean, I'm still up at the crack of dawn but it's nice not to have to get ready and be anywhere! Trying to enjoy every second because next week it is back to work for a few more days...THEN it will really be summer vacation (I think). Oh well, I'm still appreciating the slower pace... I need it! My plan is to lay in bed watching the Today Show and then when I do get up and shower, it will only be to put on another pair of jammies (leggings). Ahhh, cozy days...now we're talking! I'm thinking of getting into Downton Abbey Season 1 on Netflix...thoughts?! So anyway, let's recap some of this weeks high points, shall we? 2. Likely this was our last trip to Epcot for a while (probably until after baby), it was such a beautiful day. Epcot is my favorite park, I just love spending the day there with hubby! We do have one more Disney day trip left in July (it's going to be HOT)...but I'm thinking that will be to the Magic Kingdom. Then we really could say the next time we go back will be with our little sweetie! 3. Mallory and I are really looking forward to June 20th! 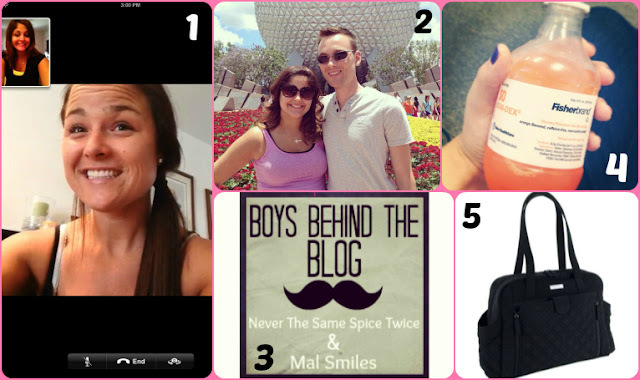 Show off your hubby, and let him share some of your spotlight by linking up with us! Click HERE for details - it's going to be fun I can feel it! 4. I'm not overjoyed over the fact that I had a glucose test the other day, however I am going to say "high five" for it being over! Honestly, it wasn't nearly as bad as I was expecting at all...I'm just glad it's over because I was totally dreading it! 5. It took a lot of convincing, but after getting a $20 coupon, and finding a gift card with $52 still left on it (score)...I was able to rationalize this purchase and get hubby on board! LOVING my new Vera Bradley diaper bag....been eyeballing it for months (apparently that is what I do)! I can't wait to use it...and since it is black, Hubs doesn't mind carrying it either! 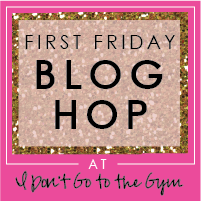 Speaking of link ups....I am co-hosting one over at I Don't Go To The Gym! 1. Follow I Don't Go To The Gym via GFC or Bloglovin' here! 2. Follow & visit the lovely co-hosts! Now that I look at our screen shot I probably should have put on more clothes to facetime with you... oh well. I was hot! I'm glad your glucose test wasn't awful and that diaper bag is super cute! Happy Friday! I'm so excited that I was able to get my boyfriend to answer the questions for the link-up!!! :) Such a great idea! looks like you had a good week! happy friday!